On a mission to understand how Sherry is made, Angus MacRaild and a group of friends travelled to Jerez in southern Andalusia, where cavernous bodegas and glass upon glass of complex wine made for an eye-opening experience. Sometimes in life you have to see something physically to properly understand it. This could be said of many things which exist to us in a more abstract familiarity. For myself and a group of friends it was certainly true of the term ‘Sherry cask’. What we understood it to be and the reality were not quite the same thing. The warmth of Jerez de la Frontera is not as fierce as the sun, glimpsed from the descending plane, might otherwise suggest. November Atlantic air channels its way across the flat lands of southern Andalusia. It’s a comfort to burn-ready Scottish skin, and to the finos and manzanillas it nurtures. We are here for what was billed as a ‘Sherry and whisky trip’, organised by winemaker and Highland Park fanatic Olivier Humbrecht. It is a packed schedule, with multiple bodega visits organised for each day along with reservations for lunch and dinner. It is a programme which, in retrospect, inevitably eats into time spent tasting whiskies at the hotel. A fact which attests to the remarkable and profound quality of the Sherries we taste. Wines of such purity, precision and depth that they essentially force the whiskies we’ve all brought with us to the sidelines. This is truly a ‘Sherry’ trip. Jerez and the surrounding towns and countryside of the ‘Sherry triangle’ are somewhat unremarkable, aesthetically speaking. There is beauty here, but probably no more so than in any number of mainland European towns and cities with sufficient history and architectural continuity to their name. The centres of population quickly fall away to expanses of scrubby, pale farmland. In places neat, in others muddled and scattered, all of it rendered glossy and occasionally harsh by the generous sunlight. There is a physical continuity to much of the architecture here which suggests a carefully nurtured and guarded heritage, something only compounded by the various people we meet at the bodegas and restaurants. It is an inexpensive place, one which remains far enough down the list of Europe’s grand tourist destinations that visitors are welcomed and attended to in a way which feels more respectful and patient than in other more ‘obvious’ parts of the continent. Sherry is a cheap drink. Too cheap, we swiftly, and collectively, come to agree. Arriving from the perspective of whisky lovers, one of the first things that strikes us is the sheer unabashed inefficiency of the whole process. Speaking to the winemakers you’d be forgiven for thinking that Sherry really only begins its life at the bodegas when it is fortified, before starting its journey through the solera system and undergoing biological ageing under its layer of yeast flor. Little is made of the harvesting of the grapes, their pressing and their fermentation in stainless steel vats. For Sherry producers the solera system and careful ageing is everything. Terroir lies as much in the ancient casks, cool bodega warehouses and oceanic breezes as in the soil in which the grapes grow. We are struck by just how much effort goes into the movement of Sherry between casks, by how much time is invested, first in the preparation of the casks themselves, then in the creation and nurture of the Sherry within. And, after all this, even 30-, 50- and 80-year-old Sherries can be purchased for almost laughable amounts of money (often well under €100 per bottle). To understand the difference between a traditional Sherry cask and the specially-commissioned, seasoned casks used primarily by the whisky industry, some historical context is essential. In the post-war period the Jerez vineyards were gradually reduced from around 25,000 hectares (ha) to 7,000ha. This contraction in the Sherry industry occurred at a fortuitous time for the whisky industry, which was expanding during the post-war decades. 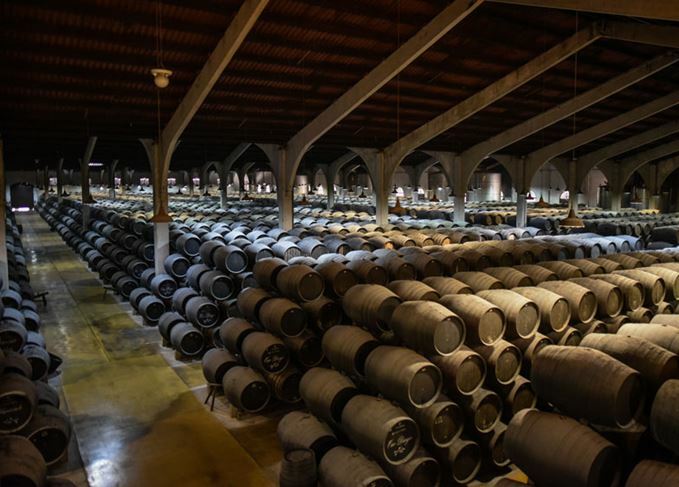 It was also an era when Sherry was commonly shipped to the UK in cask – its most important market – a practice which dried up from the 1970s and was prohibited from 1994 onwards. As a result, the industry was able to benefit from a cheaper and more readily available source of genuine ex-solera casks and transport casks. However, it must be noted, the exact meaning of ‘transport’ casks remains ill-defined to this day. It could include younger, cheaper American, or occasionally European, oak vessels used simply for moving Sherry around, as well as older, ex-solera butts utilised for the same purpose. The key aspect was that they contained Sherry intended for drinking before being filled with new make spirit. The casks used for making and maturing Sherry are also themselves ‘seasoned’, often for 15-20 years with cheap oloroso to strip out tannins before they are considered ready for the solera system. Sherry producers seek relatively inert vessels which will allow space and time for biological, and latterly oxidative, ageing to occur. The explosive demand for ‘Sherry’ casks in the whisky industry has led to the creation of what is visibly and explicitly termed a ‘secondary industry’ for the Sherry producers – the seasoning of new, primarily European oak, butts, puncheons and hogsheads with cheap, young oloroso for the whisky industry. The casks first undergo more rigorous heat treatment at the coopering stage, as specified by the whisky producers. They are then filled with a type of oloroso which will either become vinegar or distillate. This seasoning process will last for around two to three years, and often occurs in palletised warehousing systems. Even where the casks are racked in traditional bodega fashion, you can see they have been coopered with extra hoops in anticipation of future palletised warehousing in Scotland or Ireland. Until you see, touch and taste from these different casks, it is hard to grasp just how different the majority of Sherry casks being filled nowadays are to the examples commonly used 30-plus years ago. What we think of as a ‘traditional’ or ‘old-style’ Sherry cask was often made from older, more inert wood and had been influenced by Sherry intended for drinking – not for vinegar or distillation. This is perhaps the crux of the difference and one of the most eye-opening aspects of our trip. It was a remarkable experience. To sit in the shady, almost poky, cellars of Bodegas Hidalgo/La Gitana, tasting 30-year-old Palo Cortado directly from the solera casks – muscular, saline and intense in its purity and enveloping musk – struck a deep indent in our collective memory. Something that Sherry seems to share with whisky is that size is not overtly equivalent to quality. We marvelled at the cavernous, horizon-grasping expanses of the bodegas at Fundador and Valdespino, but their wines still possessed the same potency and sense of identity. It was a dizzying trip. We finished almost exhausted. Stuffed by food that was either rich and complex, or almost brazen in its fatty and salty simplicity. Sherries too numerous and dazzling to mention. Beers; Flamenco dancers; uninterrupted sunshine; bodegas with their own art galleries; archives stretching back to the 18th century; the most plainly spoken and charming hosts; so many cavernous bodegas that they run retrospectively together in the mind like an endless warren. It was the best kind of trip that re-affirms old friendships and reminded each of us why we undertake the effort and expense to go on these mini-adventures and why we share the same philosophies on wine, whisky, food and life. And, did I mention? We also tasted some pretty damned good whiskies. Somewhere along the way they just got kind of... lost. Dave Broom ponders the relationship between Sherry and Scotch whisky in sunny Spain.